Please refer to our stock # J1910 when inquiring. 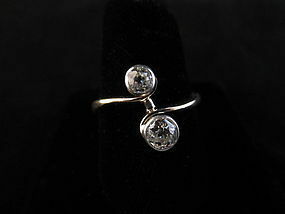 Simple and elegant, this 14k yellow gold ring is adorned with two Old Mine Cut diamonds. The larger of the two measures approximately .30 ct and grades approximately G color and VS2 on the GIA grading scale. The smaller of the two diamonds measures approximately .20 ct and is well matched to the other at G color and SI1 clarity. The bezel settings around the diamonds are white gold. It is in excellent condition and is currently a size 7.75. The diamonds are bright and sparkle very well. Since they are Old Mine Cuts, they reflect very dark in the pictures, they are not dark stones at all.